What sets apart a person with O-positive blood from someone with AB-positive blood? And what happens if your donated blood is found to carry a disease? These are some questions people may have on blood and its uses, and here are the answers, verified by the Singapore Red Cross Society and the Health Sciences Authority (HSA). Q One unit of your blood had been collected at the blood bank. How many lives can be saved with that single pack of blood? A Three. Every pack of blood gets separated into three parts: red cells, platelets and plasma. Each can be used for different medical issues. Red cells can be given to someone undergoing an operation; platelets can help those with dengue fever; while plasma is a lifeline for people with disorders that prevent blood from clotting properly. Q It is an emergency! A man has been in an accident and needs blood urgently. But his blood type is unknown. At the hospital, what blood type will he be given? A Doctors will transfuse type O blood for him - also known as the emergency blood type. It is also the most common blood type in the Singapore population. Q Your blood group is AB-positive. What options do you have, in case you need a transfusion? A As the universal recipient, you can receive red blood cells of any blood group. However, there is more to it than just the ABO blood group system. Every blood recipient will also be screened for red cell antibodies, which also play a role in the matching process. 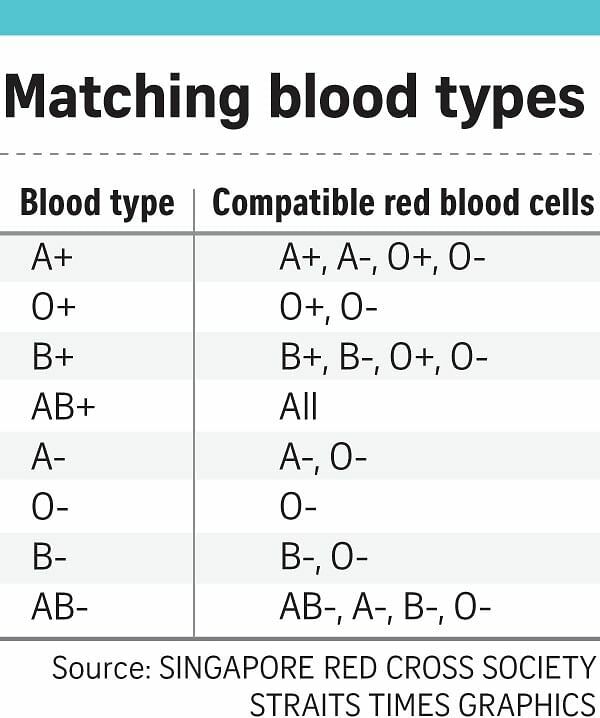 The accompanying table shows the general compatibility of the ABO blood types. Q Your national registration identity card (NRIC) already states your blood group is O-positive. When donating blood, can the blood group testing be skipped? A There is a chance that the blood type stated on your IC is wrong. The donor's blood group is tested using a highly accurate method regardless of the information on the IC. Since late 2002, the new NRIC no longer bears the blood group information. Q But what if you are not a first-time donor? A Even if you have given blood dozens of times, your blood group will be tested every time for safety and compatibility. Q You are a 16-year-old student who is keen to donate blood. But some websites state that donors are usually 18 to 60 years old. Do you have to wait? A One can give blood from the age of 16. But youth aged 16 and 17 require the approval of a parent or guardian. They will need to hand in a signed parental consent form when they show up to donate blood. Q Can donating blood help you to lose weight? A No, it does not. While there may be mild transient weight changes after donating blood, the fluid lost will usually be restored by the body within the next 12 to 24 hours. Q Some hospitals are farther from HSA than others. How is blood transported from place to place, and kept at ideal temperatures? A Donated blood and blood products are transported in insulated cooler boxes, like the kind used to keep drinks cold. But these boxes have been "validated" as having the optimal quantity of cooling material needed for an ideal temperature to be maintained till the blood components reach their destination. Q You indulged in a fast-food feast last night. Why is it not a good idea to donate blood the next day? A A heavy, fatty meal causes the amount of fat in the circulatory system to rise temporarily. This makes the plasma in the blood cloudy, which may, in turn, interfere with laboratory test results. The tests usually rely on optical density, so cloudy plasma could give a false positive - when the result states a disease is present in one's blood, when it is actually not. In fact, any oily food can throw a spanner in the works. So, take a light meal before you donate blood. Q When patients receive blood, they pay a fee. Can you get paid for giving your blood to them? A No. Blood donation is voluntary. If donors are paid, it may spur people to give blood for the wrong reasons, or even withhold important health information - for instance that they have a sexually transmitted infection. This will affect the safety of their blood. The fee that patients pay, on the other hand, is not for the blood itself, but for the processing of blood. It includes laboratory testing for infections and transport costs. This fee is subsidised by the Government and hospitals for Singapore citizens and, to a lesser extent, permanent residents. The hospital subsidy differs based on the choice of ward and means-testing status. Q If your donated blood tests positive for a disease at the lab, will you ever know? A Yes. All donated blood is tested for at least five infections: HIV, hepatitis B and C, syphilis, as well as Zika. If your blood shows signs of any of these diseases, the blood bank will contact you to inform and advise you if further medical care is required.